The Foundation provides development support, documentation and developer education for popular libraries such as jQuery, which is used by more than half of the top one million web sites. Projects hosted by the jQuery Foundation are open source with liberal licensing, free to use without ever having to worry about royalties. The Foundation encourages the adoption of open standards and implements tools to help developers apply those standards. Foundation projects aspire to give everyone, regardless of their circumstances, access to the web. For more information, visit http://jquery.org. The Dojo Foundation is a 501(c)(6) non-profit foundation created in 2005, dedicated to creating a level playing field for the development of new Open Web technologies. 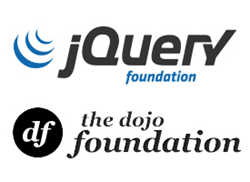 The Dojo Foundation hosts a growing number of projects including the Dojo Toolkit, Lo-Dash, Grunt, Intern, RequireJS, and Tessel. The Foundation has received code contributions from over 1000 individuals and 200 corporations worldwide. Online at http://dojofoundation.org/ .